Dr Mustafa Barghouti, Palestinian democracy activist and presidential candidate in 2005, and Lord Levy, former Prime Minister Tony Blair’s adviser on the Middle East, considered the question, ‘Beyond The Quartet: Time For A New Approach To The Middle East Peace Process?’ on Tuesday 28th February. Dr Barghouti spoke of the paralysis of the peace process and the absence of meaningful efforts by the international community to revive it. He said that since the international community was ‘failing to perform and carry out its duties’, Palestinians were ‘obliged to find alternative ways’, one of which was non-violent resistance and one of which was the use of the United Nations. He saw the rise of a new, non-violent movement, built on the past and heritage of the Palestinian people, but which would use every international arena including the United Nations, ‘without giving up any readiness for any diplomatic effort when we see that that diplomatic effort is meaningful’. 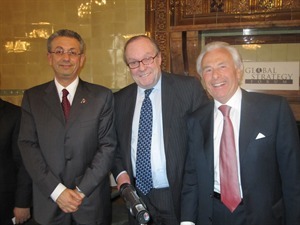 Following Dr. Barghouti, Lord Levy said that he was a little lost on a new approach to a peace process, since there had not been a peace process ‘for a long time’. He said that was a dream of one, and a vision of one, but the reality was that there was no such thing going on today. He felt that the Quartet had achieved very little and analysed why there had been so little progress – not least because the component parts of the Quartet were not in agreement and Israel ran a ‘master class in divide and rule’. He thought that the Quartet was ‘probably past its sell-by date’ and that a mechanism was needed to inject ‘oxygen into a process that frankly is probably not on life support any more’. In answer to what there could be beyond the Quartet, he said that he would like to see a permanent negotiating team put in place by both sides, which would discuss issues and problems on a continual basis and would try to influence their respective leaderships and world leadership. Until both sides could sit down together, he said, the illusion of the Quartet would not deliver anything. He hoped that people on both sides wanted progress and said that the present vacuum was untenable. It was possible to make a difference – leaderships changed and positions changed, but he concluded that while Israel understood that US administration would always have its back, it would be an uphill battle. To listen to the debate again, please click here.